Aksum was an important participant in international trade from the 1st century CE (Periplus of the Erythraean Sea) until circa the later part of the 1st millennium when it succumbed to a long decline against pressures from the various Islamic powers leagued against it. The Aksumite Empire or Axumite Empire (sometimes called the Kingdom of Aksum or Axum), was an important trading nation in northeastern Africa, growing from the proto-Aksumite period c. fourth century B.C.E. to achieve prominence by the first century C.E. It is also the alleged resting place of the Ark of the Covenant and the home of the Queen of Sheba. Corresponding to present day Ethiopia, this was an ancient African civilization that traded widely throughout the ancient world. Converting to Christianity in the fourth century, the Ethiopian Orthodox Church continues to be the tradition of the majority of Ethiopians using its language (Ge'ez) and perpetuating aspects of the civilization's artistic tradition. Ethiopian culture today has its roots in this civilization. The decline, from the seventh century, has been attributed both to climate change and to defeat at the hands of Judith, a legendary Jewish Queen. The 51 references in the Bible to "Ethiopia" refer to this civilization. In the eighteenth century, enslaved black preachers in the U.S. began to revive interest in the Aksumite empire, and in other ancient African civilizations, as a platform to instill pride and self-respect among their people. This gave momentum to what has been described as Ethiaopianism, which "revered" Ethiopia "as a symbol of black accomplishment and the 'promised land' for uprooted Africans." Reverence for Ethiopia has developed into "a multi-billion dollar industry, ranging from roots, reggae music, Afrocentric book publishing, African heritage tourism, and fashion and beauty products." Coins of king Endybis, 227-235 C.E. British Museum. The left one reads in Greek "AΧWMITW BACIΛEYC," "King of Axum." The right one reads in Greek: ΕΝΔΥΒΙC ΒΑCΙΛΕΥC, "King Endybis". Aksum and South Arabia at the end of GDRT's reign in the 3rd century CE. Located in northern Ethiopia and Eritrea, Aksum was deeply involved in the trade network between India and the Mediterranean. According to the Periplus, the ruler of Aksum in the during this time was Zoscales, who, besides ruling in Aksum, also controlled two harbors on the Red Sea: Adulis (near Massawa) and Avalites (Assab). He is also said to have been familiar with Greek literature: "These places, from the Calf-Eaters to the other Berber country, are governed by Zoscales; who is miserly in his ways and always striving for more, but otherwise upright, and acquainted with Greek literature" (Periplus of the Erythraean Sea). The Kingdom of Aksum benefited from a major transformation of the maritime trading system that linked the Roman Empire and India. This change took place around the start of the Common Era. The older trading system involved coastal sailing and many intermediary ports. The Red Sea was of secondary importance to the Persian Gulf and overland connections to the Levant. Starting around 100 B.C.E. a route from Egypt to India was established, making use of the Red Sea and using monsoon winds to cross the Arabian Sea directly to southern India. By about 100 C.E. the volume of traffic being shipped on this route had eclipsed older routes. 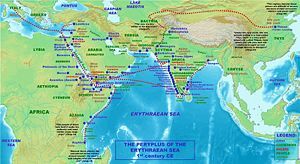 Roman demand for goods from southern India increased dramatically, resulting in greater number of large ships sailing down the Red Sea from Roman Egypt to the Arabian Sea and India. The Kingdom of Aksum was ideally located to take advantage of the new trading situation. Adulis soon became the main port for the export of African goods, such as ivory, incense, gold, and exotic animals. In order to supply such goods the kings of Aksum worked to develop and expand an inland trading network. A rival, and much older trading network that tapped the same interior region of Africa was that of the Kingdom of Kush, which had long supplied Egypt with African goods via the Nile corridor. By the first century C.E., however, Aksum had gained control over territory previously Kushite. The Periplus of the Erythraean Sea explicitly describes how ivory collected in Kushite territory was being exported through the port of Adulis instead of being taken to Meroë, the capital of Kush. During the second and third centuries the Kingdom of Aksum continued to expand their control of the southern Red Sea basin. A caravan route to Egypt was established which bypassed the Nile corridor entirely. Aksum succeeded in becoming the principal supplier of African goods to the Roman Empire, not least as a result of the transformed Indian Ocean trading system. In the third century, Aksum began interfering in South Arabian affairs, controlling at times the western Tihama region among other areas. By the late third century it had begun minting its own currency and was named by Mani as one of the four great powers of his time along with Persia, Rome, and China. It converted to Christianity in 325 or 328, under King Ezana and was the first state ever to use the image of the cross on its coins. At its height, Aksum controlled northern Ethiopia, Eritrea, northern Sudan, southern Egypt, Djibouti, Yemen, and southern Saudi Arabia, totaling 1.25 million km². It was a quasi-ally of Byzantium against the Persian Empire of the day and declined after the seventh century due to unknown reasons, but informed speculation suggests the rise of Islam heavily impacted its ability to trade with the Far East in the era when shipping was limited to coastal navigation as well as cut it off from its principal markets in Alexandria, Byzantium, and Southern Europe. After a second golden age in the early sixth century, the empire began to decline, eventually ceasing its production of coins in the early seventh century. It finally dissolved with the invasion of the pagan or Jewish queen Gudit in the ninth or tenth century, resulting in a Dark Age about which little is known until the rise of the Zagwe dynasty. Aksum was previously thought to have been founded by Semitic-speaking Sabaeans who crossed the Red Sea from South Arabia (modern Yemen) on the basis of Conti Rossini's theories and prolific work on Ethiopian history, but most scholars now agree that it was an indigenous development. Scholars like Stuart Munro-Hay point to the existence of an older D’mt or Da'amot kingdom, prior to any Sabaean migration c. fourth or fifth century B.C.E., as well as to evidence of Sabaean immigrants having resided in the region for little more than a few decades. Furthermore, Ge'ez, the ancient Semitic language of Eritrea and Ethiopia, is now known not to have derived from Sabaean, and there is evidence of a Semitic speaking presence in Ethiopia and Eritrea at least as early as 2000 B.C.E. Sabaean influence is now thought to have been minor, limited to a few localities, and disappearing after a few decades or a century, perhaps representing a trading or military colony in some sort of symbiosis or military alliance with the civilization of D`mt or some proto-Aksumite state. Adding more to the confusion, there existed an Ethiopian city called Saba in the ancient period that does not seem to have been a Sabaean settlement. The Empire of Aksum at its height extended across portions of present-day Eritrea, northern Ethiopia, Yemen, southern Saudi Arabia, northern Djibouti, and northern Sudan. The capital city of the empire was Aksum, now in northern Ethiopia. Today a country village, the city of Aksum was once a bustling metropolis, a bustling cultural and economic center. Two hills and two streams lie on the east and west expanses of the city; perhaps providing the initial impetus for settling this area. Along the hills and plain outside the city, the Aksumites had cemeteries with elaborate grave stones called Steale, or obelisks. Other important cities included Yeha, Hawulti, Matara, Adulis, and Qohaito, the last three of which are now in Eritrea. 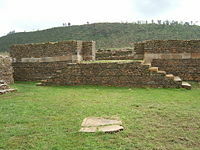 Proto-Tigrayans and Proto-Amharas are believed to be the main ethnicity of the empire of Axum in the first millennium C.E. Their language, in form of Ge'ez, remained the language of later Ethiopian imperial court as well as the Eritrean and Ethiopian Orthodox Church. The Aksumite people represented a mix of a Semitic-speaking people, Cushitic-speaking people, and Nilo-Saharan-speaking people (the Kunama and Nara) collectively known as Habeshas. The Aksumite kings had the official title ngś ngśt—King of Kings (later vocalization nigūśa nagaśt, Modern Ethiosemitic nigūse negest). 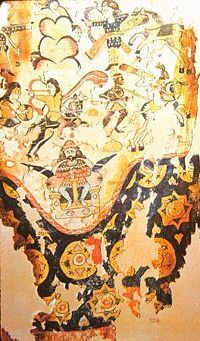 Aksumite kings traced their lineage to Solomon and the Queen of Sheba. This royal heritage and title was claimed and used by all emperors of Ethiopia. Aksumites did own slaves, and a modified feudal system was in place to farm the land. Egyptian-woven woolen curtain or trousers, which was a copy of a Sassanid silk import, which was in turn based on a fresco of King Khosrau II fighting Axum Ethiopian forces in Yemen, fifth–sixth century. Axum traded with India and Rome (later Byzantium), exporting ivory, tortoise shell, gold, and emeralds, and importing silk and spices. Axum's access to both the Red Sea and the Upper Nile enabled its strong navy to profit in trade between various African (Nubia), Arabian (Yemen), and Indian states. In the third century C.E., Axum acquired tributary states on the Arabian Peninsula across the Red Sea, and by 350, they conquered the Kingdom of Kush. The main exports of Axum were, as would be expected of a state during this time, agricultural products. The land was much more fertile during the time of the Aksumites than now, and their principle crops were grains such as wheat and barley. The people of Aksum also raised cattle, sheep, and camels. Wild animals were also hunted for things such as ivory and rhinoceros horns. They traded with Roman traders as well as with Egyptian and Persian merchants. The empire was also rich with gold and iron deposits. These metals were valuable to trade, but another mineral was also widely traded. Salt was found richly in Aksum and was traded quite frequently. Axum remained a strong empire and trading power until the rise of Islam in the seventh century. However, because the Axumites had sheltered Muhammad's first followers, the Muslims never attempted to overthrow Axum as they spread across the face of Africa. Nevertheless, as early as 640, Umar ibn al-Khattāb sent a naval expedition against Adulis under Alkama bin Mujazziz, but it was eventually defeated. Axumite naval power also declined throughout the period, though in 702, Aksumite pirates were able to invade the Hejaz and occupy Jeddah. In retaliation, however, Sulayman ibn Abd al-Malik was able to take the Dahlak Archipelago from Axum, which became Muslim from that point on, though later recovered in the ninth century and vassal to the Emperor of Ethiopia. Eventually, the Islamic Empire took control of the Red Sea and most of the Nile, forcing Axum into economic isolation. What is now Eritrea was conquered in 710. However, it still had relatively good relations with all of its Muslim neighbors. Islam placed Ethiopia in a special category of territory because the early followers of Muhammad had taken refuge there, where the Emperor had welcomed them. A saying of Muhammad that Ethiopia should be left in peace precluded invasion, as long as Ethiopia left Muslims in peace. Two Christian states northwest of Axum (in modern day Sudan), Maqurra and Alwa, survived until the thirteenth century when they were finally forced by Muslim conversion to become Islamic. Axum, however, remained untouched by the Islamic movements across Africa. Ruins of Dungur palace in Aksum. Before its conversion to Christianity the Aksumites practiced a polytheistic religion not unlike the Greek’s system. Astar was the main god of the pre-Christian Aksumites, and his son, Mahrem (Maher), was who the kings of Aksum traced their lineage. In about 324 C.E., the King Ezana II was converted by his slave-teacher Frumentius, the founder of the Ethiopian Orthodox Church. Frumentius taught the emperor while he was young, and at some point staged the conversion of the empire. It is known that the Axumites converted to Christianity because in their coins they replaced the disc and crescent with the cross. Frumentius was in contact with the Church in Alexandria and was appointed Bishop of Ethiopia around 330 C.E. Alexandria never reigned Aksum in tightly, rather allowing its own form of Christianity form, however, the church did retain a minor influence. Aksum is also the alleged home of the holy relic the Ark of the Covenant. The Ark is said to have been placed in the Church of Mary of Zion by Menelik I for safekeeping. The Empire of Aksum is notable for a number of achievements, such its own alphabet, the Ge'ez alphabet (which evolved from Epigraphic South Arabian during the late pre-Aksumite and proto-Aksumite period), which was modified to include vowels, becoming an abugida. 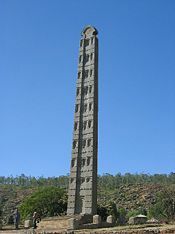 Furthermore, in the early times of the empire, around 1700 years ago, giant Obelisks to mark emperor's (and nobles') tombstones (underground grave chambers) were constructed, the most famous of which is the Obelisk of Axum. Under Emperor Ezana, Axum adopted Christianity in place of its former polytheistic and Judaic religions around 325. This gave rise to the present day Ethiopian Orthodox Tewahedo Church (1959), and Eritrean Orthodox Tewahdo Church (1993). Since the schism with orthodoxy following the Council of Chalcedon (451), it has been an important Miaphysite church, and its scriptures and liturgy are still in Ge'ez. It was a cosmopolitan and culturally important state. It was a meeting place for a variety of cultures: Egyptian, Sudanic, Arabic, and Indian. The major Aksumite cities had Sabean, Jewish, Nubian, Christian, and even Buddhist minorities. The Empire of Aksum was also the first African polity to issue its own coin. From the reign of Endubis up to Armah (approximately 270 to 610), gold, silver, and bronze coins were minted. Issuing coinage in ancient times was an act of great importance in itself, for it proclaimed that the Axumite Empire considered itself equal to its neighbors. Many of the coins are used as signposts about what was happening when they were minted. An example being the addition of the cross to the coin after the conversion of the empire to Christianity. The presence of coins also simplified trade, and was at once a useful instrument of propaganda and a source of profit to the empire. Aksum is the apparent home of the Ark of the Covenant. The Ark is said to be housed in the Church of Mary of Zion, and is guarded heavily by the priests there. The Ark was said to have been brought to Aksum by King Solomon and the Queen of Sheba's son and placed under guard. Controversy surrounds the Church, since no one but the one guard priest is allowed in, no one can verify the Ark's existence. Typical Aksumite architecture - the monastery of Debre Damo. The Stelae are perhaps the most identifiable part of the Aksumite legacy. These stone towers served to mark graves or represent a magnificent building. The largest of these towering obelisks would measure 33 meters high had it not fallen. The Stelae have most of their mass out of the ground, but are stabilized by massive underground counter-weights. The stone was often engraved with a pattern or emblem denoting the king's or the noble's rank. Aksum began to decline in the seventh century, and the population was forced to go farther inland to the highlands, eventually being defeated around 950. Local history hold that a Jewish Queen named Yodit (Judith) or "Gudit" defeated the empire and burned its churches and literature, but while there is evidence of churches being burned and an invasion around this time, her existence has been questioned by some modern authors. Another possibility is that the Axumite power was ended by a southern pagan queen named Bani al-Hamwiyah, possibly of the tribe al-Damutah or Damoti (Sidama). After this period, the Axumite Empire was succeeded by the Zagwe dynasty in the eleventh century or twelfth century, although limited in size and scope. However, Yekuno Amlak, who killed the last Zagwe king and founded the modern Solomonic dynasty traced his ancestry and his right to rule from the last emperor of Axum, Dil Na'od. Other reasons for the decline are less romantic and more scientific. Climate change and trade isolation are probably also large reasons for the decline of the culture. Over farming on the land lead to decreased crop yield, which in turn lead to decreased food supply. This in turn with the changing flood pattern of the Nile and several seasons of drought would alter all of Aksum’s agricultural Aksum’s geographic location would make it less important in the emerging European economy. The Aksumite Empire is portrayed as the main ally of Byzantium in the Belisarius series by David Drake and Eric Flint published by Baen Books, Riverdale, NY. ↑ New York Metropolitan Museum, Foundations of Aksumite Civilization and Its Christian Legacy. Retrieved May 26, 2008. ↑ When We Ruled, 50 Greatest Africans. Retrieved May 26, 1987. ↑ Santorri Chamley, Rise and Rise of Black Consciousness, New African. Retrieved May 26, 2008. ↑ W.H. Schoff (tr. & ed. ), The Periplus of the Erythraean Sea: Travel and Trade in the Indian Ocean by a Merchant of the First Century, Ancient History Sourcebook, Fordham University. Retrieved May 26, 2008. ↑ Stanley M. Burnstein, State Formation in Ancient Northeast Africa and the Indian Ocean Trade, University of California at Los Angeles. Retrieved May 26, 2008. ↑ Peter Turchin, Jonathan M. Adams, and Thomas D. Hall, East-West Orientation of Historical Empires, University of Connecticut. Retrieved May 26, 2008. ↑ Munro-Hay (1991), p. 57. ↑ Siegbert Herausgegeben von Uhlig (ed. ), Encyclopedia Aethiopica (Wiesbaden, DE: Harrassowitz Verlag, ISBN 9783447047463), p. 732. ↑ Spencer Trimingham, Islam in Ethiopia (London: Frank Cass & Co), p. 46. ↑ Daniel Kendie, The Five Dimensions of the Eritrean Conflict 1941–2004: Deciphering the Geo-Political Puzzle (Prairie View, TX: Daniel Kendie, 2005, ISBN 9781932433470). Butzer, Karl W. 1981. "Rise and Fall of Axum, Ethiopia: A Geo-Archaeological Interpretation." American Antiquity. 46:3:471-495. Kobishchanov, Yuri M., Joseph W. Michels (eds.). 1979. Axum. University Park, PA: Penn State University Press. ISBN 0-271-00531-9. Mukhtār, Muḥammad Jamāl al-Dīn. 1981. Ancient Civilizations of Africa. London: Heinemann Educational Books. ISBN 9780435948054. Munro-Hay, Stuart. 1991. Aksum: A Civilization of Late Antiquity. Edinburgh, UK: University Press. ISBN 0-7486-0106-6. Williams, Stephen. 2007. "Ethiopia Africa's Holy Land." New African. 458:94-97. All links retrieved February 20, 2016. Ancient History Sourcebook: Accounts of Meröe, Kush, and Axum. This page was last modified on 14 February 2019, at 15:53.